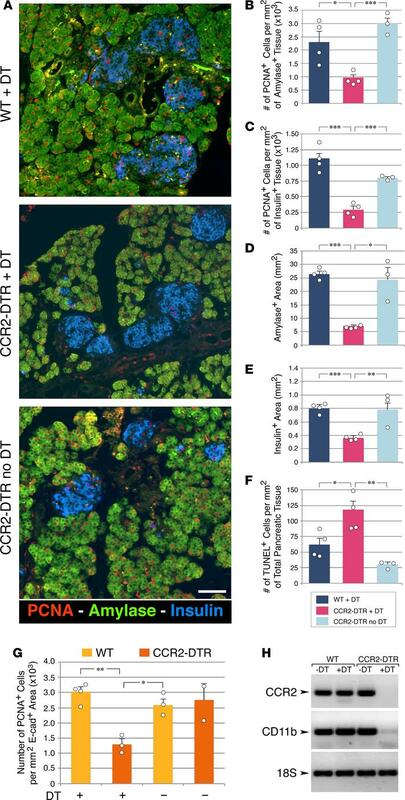 Effects of CCR2+ cell depletion on the proliferation of the exocrine and endocrine compartments of the pancreas. (A) Pancreatic sections of diphtheria toxin–treated (DT-treated) P10 mice stained for amylase, insulin and the proliferation marker PCNA. Scale bar: 50 μm. Representative of at least n = 4 per group. (B and C) Frequency of PCNA+ cells detected within amylase+ (B) and insulin+ (C) areas. (D and E) Morphometric analysis of amylase+ and insulin+ areas. (F) Frequency of TUNEL+ apoptotic cells in pancreatic epithelial tissue identified by E-cadherin staining. (B–F) Mean ± SEM of n = 3–4 mice per group. (G) Frequency of proliferating epithelial cells in P2 pancreatic explants from CCR2DTR/+ mice and WT littermates after culture in the presence or absence of DT (n = 2–4 experiments using pools of 3–4 pancreata). (H) PCR analysis of CCR2 and CD11b mRNA transcripts in organ cultures shown in G, validating the depletion of CCR2+ cells in DT-treated CCR2DTR/+ tissues. Mean + SD. Representative of n = 2–4 experiments. *P < 0.05, **P < 0.01, ***P < 0.001, 1-way ANOVA nonparametric test, followed by Bonferroni post-hoc test.